It’s a common story in laboratories all across the country. A new researcher joins the team, orders chemicals for research projects and then somewhere down the line he or she joins a new study at another university or research center. Typically, once the researcher leaves, those chemicals are left behind in cupboards, storage areas and cabinets with no one to oversee them. Left behind are stores of small containers of chemicals that are out-of-date, contaminated, partially used, leaking, or simply no longer needed. In extreme cases, some of these chemicals, like picric acid which is routinely found in university laboratories become explosive as they age. Within just a few months of time it can explode just from the friction of opening the lid. Situations like this can become a regulatory and legal nightmare. Whether its EPA or state fines for violations of hazardous waste storage and disposal laws or danger to students or faculty who may unsuspectingly open up a bottles or containers that may blow up in their face. The liability to University could be substantial. Filled containers of chemical wastes should be stored no longer than 180 days before requesting a waste pickup. In addition, no more than 50 gallons of chemical waste may be stored in a laboratory at any one time. To protect employees from potential hazards or to simply reduce the inventory of unwanted materials, facilities must periodically remove these unused chemicals from inventory. 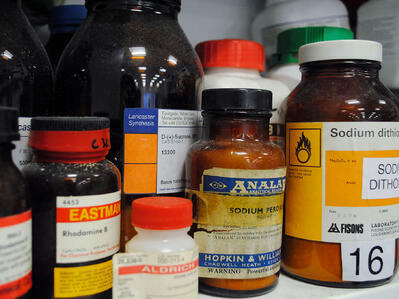 How Can You Safely Dispose of Lab Chemicals? The stakes are high when you deal with expired chemicals. The health and safety of your employees and your local community can be jeopardized if they are not handled appropriately. There are criminal penalties if you throw them out in the trash or pour them down a drain or outside. Many of these small quantities of dangerous chemicals cannot safely be combined, and even if you could combine some without blowing yourself up, you could create an extremely toxic substance that could release dangerous vapors that could make students or the surrounding community violently ill or worse. the resultant mixture is often more expensive to dispose in accordance of hazardous waste laws. The Environmental Protection Agency (EPA) and California Department of Toxic Substances Control (DTSC) requires that transportation carriers be federally licensed and insured and that the disposal facilities that will receive the chemicals comply with Treatment, Storage and Disposal Facility (TSDF) standards. The Department of Transportation (DOT) mandates that waste materials be packaged, labeled and shipped according to its regulations, which are especially complex for these types of shipments. An easy, cost-effective way to ship small collections of different hazardous chemicals off site is to use a process known as lab packing. Based on generator preference, the waste is either removed the same day or scheduled on a routine basis. The appropriate paperwork (manifests, shipping inventories, MSDS, etc.) is completed for shipment. Upon completion, the disposal company provides you with a complete and detail drum inventory and packing list and can arrange transportation and disposal as well. It’s important to understand that the contractor handling your lab pack services determines the standards, by which your chemicals are managed and packaged. This can result in vastly different packaging and managing methods among different waste disposal service. Ultimately, your vendor’s goal should be to package your chemicals in the largest allowable container available in order to manage your disposal process as cost effectively as possible. The state of California is one of the most, if not the most, regulated state in the country when it comes to hazardous and non-hazardous waste. This case study will highlight the importance of working with the right vendor to ensure that you stay on the right side of the law. Make sure you find the right partner to keep your employees safe and avoid regulatory hassles.